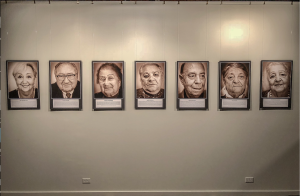 In an age when 22 percent of American millennials said they haven’t heard of the Holocaust or are confused as to what the historical event was, “Faces of Survival” meets the viewer head on with a powerful reminder of what modern genocide looks like. 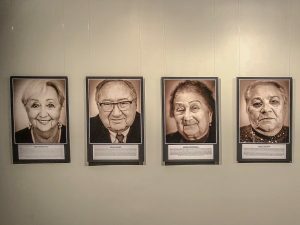 The Virginia Holocaust Museum’s (VHM) newest portrait exhibit features more than a dozen Holocaust survivors currently living the Tidewater (Hampton Roads) Region. The exhibit was the creation of photographer Dean Whitbeck in partnership with The United Jewish Federation of Tidewater. The same survey reported by the Washington Post also found that two-thirds of American millennials cannot identify what Auschwitz was – the most notorious of all the Nazi death camps based in Poland – that exterminated close to 1.1 million people. Yet despite the increasingly modern relevance, contemporary knowledge of the genocide that killed more than 6 million Jews during World War II is deeply lacking. Angela Rueda, Assistant Curator at the Virginia Holocaust Museum in Richmond, said the photography exhibit is a crucial part of preserving these stories and legacies, especially stories that might be overlooked. The portrait exhibit is a striking installation in the renovated space that houses the VHM. Once an American Tobacco Company warehouse, the massive brick building is a cavernous and winding dedication to the victims and survivors of the Holocaust. “Faces of Survival” forces its audience to be eye-to-eye with Virginia’s own survivors; a move that not only allows for a naked display of humanity, but holds the viewer accountable for a narrative that too many people don’t want to acknowledge. While the modern memory of the atrocities of the Holocaust are fading, the historical realities of anti-Semitism, prejudice, and pervasive violence is far from disappearing. In fact, anti-Semitic hate crimes are on the rise in the US, up 57 percent in 2017 from 2016. The modern narrative reflects a regressive turn back to the authoritarianism and fascist mentality of the 1930s and 40s, along with the complacency that accompanies it. Something the Jewish writer and philosopher, Hanna Arendt, once referred to as “the banality of evil” when covering the Nazi war crimes trial of Adolph Eichmann, one of the architects of the holocaust. As a more modern example, Rueda says the VHM is turning their focus to programming surrounding Charlottesville’s Unite the Right rally last summer; where white supremacist James Fields Jr killed counter-protester Heather Heyer. “Especially today with a lot of the rhetoric that’s out there, you can see a connection between… the ideology from the Holocaust to Neo-Nazi groups,” said Rueda. “We’re working to preserve these stories because they are relevant today, unfortunately.” She went on to explain that one of their core missions is to encourage tolerance through education. Whitbeck, however, stressed that the connection goes deeper than just the rise of neo-Nazi groups in the US. Because so many of the Tidewater survivors came to the US as immigrants – many of them Russian survivors who fled Moscow – it opens a crucial dialogue about refugees and immigration. Whitbeck focuses his portrait photography on documenting the dignity and courage found in marginalized communities, be it Holocaust survivors or working with Reestablish Richmond to create portraits of refugees who have sought sanctuary in Richmond away from their home countries as a result of war. 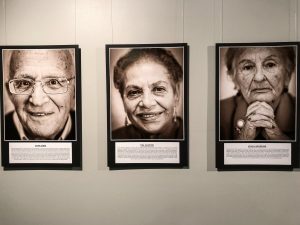 Each survivor of the Tidewater Holocaust portrait series has a different story, from fleeing their home to living in hiding to escape persecution and death. While the topic is unspeakably heavy, Whitbeck references the impact and power of these kinds of individual interactions in a 2017 Ted Talk. Since many of his Tidewater participants didn’t speak English, he said, “Half the time I just had to work with this way of communicating kinesthetically and physically,” going on to say that sometimes he was less a photographer and more a visual communicator. It’s through this truth, this humanity, this head-on, face-to-face interaction between viewer and survivor, our present day narrative can begin to re-acknowledge the weight of our country’s recent and debilitating history. The exhibit runs through July 29 at the Virginia Holocaust Museum on 21st and Cary. Admission is free and open to the public.